In 1999, windsurfer Michael Percy picked up a new hobby that would grow into a lifelong passion and a business, now in its 15th year of service to Fort Walton Beach. Percy, an avid windsurfer, became discouraged when he couldn’t ride in the Gulf Coast’s ‘white winds.’ He soon discovered kiteboarding, an up-and-coming sport out of Hawaii. The winds of change began to swirl, and Percy’s new business took flight. XL Kites began training and providing gear to customers, changing and growing as the sport took shape. As the gear evolved, so did the clientele. Of course, like anything worth doing, it takes practice and dedication. You can’t just pick up a kite and expect to ride on the first day. That being said, even visitors to the Gulf Coast could learn to kiteboard over the duration of a vacation. If you do find yourself smitten, you can take your board home with you – wherever you may live. The kites sold by XL Kites can be used on the water, as well as in the snow or on the pavement. You simply change the type of board you use – from surf to snow to skate. 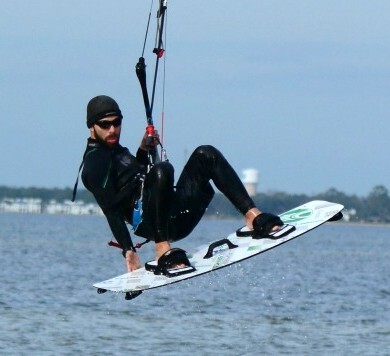 If you want to get started on the Gulf Coast, XL Kites is the place to go. They provide instruction and lessons, while specializing in sales and repair of your kiteboarding gear. Be prepared to fall. Palermo likens the learning curve to that of riding a bike as a child. “To me, it’s not something I sold you, it’s something I gave you that you can keep for the rest of your life,” he says. Of course, he’s talking about the rush you get every time you pick up your kite and the wind takes hold. It’s something you can do with friends, or in solitude. Kiteboarding is not an attraction, it’s a lifestyle, he notes. “You feel compelled to keep doing it, and the more you do it, the more fulfillment you get out of it,” Palermo says. See where the wind takes you at XL Kites in Fort Walton Beach. For more information, contact the store at (850) 243-5483 or visit them online.